Based on reviews from 13 experts and 2,141 users. Learn how our rankings work or see our guide to Adidas indoor football boots. Updated Apr 2019. The Three Stripes is practically untouchable when it comes to football boot construction. This giant brand has more than proved itself as they pump out quality soccer cleats season after season for decades. One only has to look at who’s sporting the recognizable Three Stripes logo in their soccer cleats to know that the brand is chosen by the cream of the crop in association football. The Non Stop Grip or NSG is a technology created to provide ball control even in the worst weather conditions. This technology makes use of texture in the upper to bring ball control. Especially useful during wet weather conditions, NSG affords the player the same amount of friction and control that is similar to when playing during dry weather. The Adidas indoor court football boot with this feature is the Adidas X 17.2 football boot. Adidas’ Boost technology hits two birds with one stone as it targets comfort and responsiveness. The material is created out of small TPU capsules that are heated and expanded. These capsules are then bound together to produce a midsole which gives double the responsiveness compared to the typical single piece midsole. The football boot models with this innovation include the Adidas Copa Tango 17.1, the Adidas Predator Tango 18+, as well as the Adidas Ace Tango 17+ Purecontrol. The Techfit technology is found in several of Adidas’ products. This versatile material, while commonly found in football boots, is also used in the making of sportswear. When this element is used in footwear construction, however, it makes for a seamless upper which goes along with the natural movements of the foot. The fit it provides is also comparable to that of a sock that brings a supportive feel. The indoor court cleats from the Three Stripes with this element is the Adidas X Tango 17.3 cleat. Primeknit is the Three Stripes’ answer to the knit trend in football boots. This one-piece football shoe element brings a snug second-skin like for the player’s foot. It is created through digitally knitting the entire upper; doing away with surplus materials that creates waste. 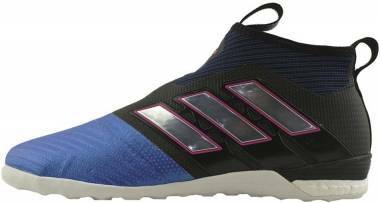 The Adidas Predator Tango 18+ shoe is one of the indoor court soccer cleats sporting this type of upper technology. A common feature among soccer cleats, Ethyl Vinyl Acetate or EVA is a tried-and-tested cushioning material for footwear. The benefit of using EVA for cushioning is that it also doubles as a shock absorbing element; hitting two birds with one stone. Several examples of Adidas indoor court football boots that make use of this versatile component are the Adidas Mundial Goal and the Adidas Samba Classic. As the name suggests, tapes have heavily inspired this technology. The torsion tape system idea sprung from the ritual of binding athletes’ or performers’ limbs before a performance or a game. Mainly found in the Adidas Nemeziz line, this innovation affords players a secure foot lockdown as well as a snug fit. This setup also incorporates a dual-lock collar which holds down the ankle area. This allows the player rapid direction changes without losing stability. 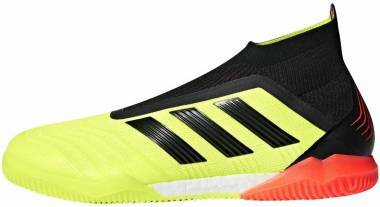 The Nemeziz indoor cleat with this technology includes the Adidas Nemeziz Tango 17.3. 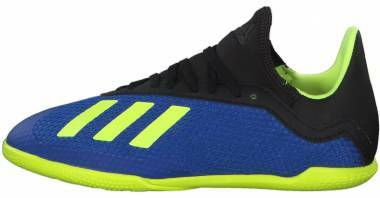 Can Adidas Indoor court football boots be used for casual wear? Yes. Some indoor court football boot models from Adidas can also be used for casual wear. While most indoor cleats are originally designed to provide traction in polished surfaces, it is also equally as efficient in varied surfaces. 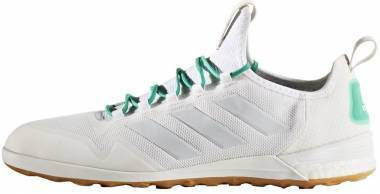 Notable soccer cleats that may be used for daily wear is the Adidas Copa Tango 18.3 Indoor, Adidas Nemeziz Tango 18.3 Indoor, and the Adidas Ace Tango 17.3 Indoor football boot. What is the difference between Flyknit and Primeknit? Both technologies involve knit construction. Although, there are a few key differences in how both elements react. Flyknit technology involves making use of stronger fibers where it is needed to bring more support. Primeknit, on the other hand, is designed to make a one-piece upper. Support for this technology is brought about by putting heat on specific areas. The heat applied melts those fibers, forging a fuse-like texture. Who are the celebrated footballers closely associated with the brand? The brand has partnered with elite athletes in the football arena resulting in the creation of a number of noteworthy collections. One of these footballers is the much celebrated Argentinian forward and captain Lionel Messi. The collaboration of both parties led to the creation of the signature Nemeziz line. The silo is quite distinct as it carries with it the unique Torsiontape technology which also gives its models a distinct look. Another professional football player that partners with the three stripes is Paul Pogba. Closely associated with the Adidas Predator line, the pro has sported a number of football boot models belonging to the collection.